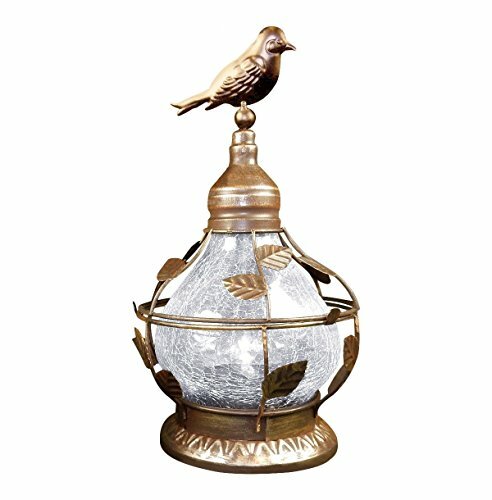 Solar Table Top Lamp, Bird Theme With Rotating Light, Crackled Glass - Bronze. * Unique table top lamp that operates at night on solar power collected by day. * Overall dimensions of lamp approximately 6" diameter x 12"H.
* Beautiful 3D artwork with leaves along the metal frame grid lines and a bird "perched" on top with a Crackled Glass designed globe. * Sturdy metal cage frame helps to protect glass globe from being broken. * Rotation feature provides moving water visual effect through crackled glass globe. * Internal rechargeable "AAA" battery (installed, replaceable) charges from direct sunlight. * For indoor or outdoor use, makes a wonderful patio table light. * Lamp and rotation features operate independently with separate switches on the bottom. SOLAR TABLE TOP LAMP : Unique table top lamp that operates at night on solar power collected by day. 3D ARTWORK : Beautiful 3D artwork with leaves along the metal frame grid lines and a bird "perched" on top with a Crackled Glass designed globe. VISUAL EFFECT : Rotation feature provides moving water visual effect through crackled glass globe. RECHARGEABLE BATTERY : Internal rechargeable "AAA" battery (installed, replaceable) charges from direct sunlight. SIZE : Overall dimensions of lamp approximately 6" diameter x 12"H.